Funds to enhance collections such as large print books, music CD’s and ebooks. Funding special building features at the Library such as the Reading Tree and Storytime Terrace in Youth Services. Support for interactive, museum-quality traveling exhibits for families. Organizing and underwriting the cost for programs series like Music@Main, What’s Cooking, and Book Talks. Sponsorship of the annual Summer Reading program and the Reception for West Bloomfield Book Groups. The purchase of sculptures and other art for both Library buildings. Underwriting the cost for special events like the National Medical Community Celebration, the Japanese student visits, and the 75th Anniversary Celebration. Actively participate in the annual Keego Harbor Memorial Day Parade to promote the Library and Summer Reading Program. Programs such as Music@Main and What’s Cooking? Your membership will help the Friends accomplish even more. 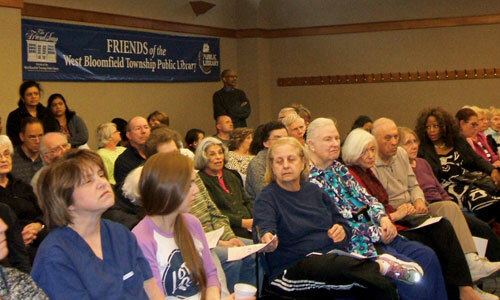 Funds donated to the Library are raised through operation of the Friendshop Used Book Store at the Main Library, special weekend book sales, and other fundraising events, as well as membership dues. Since the opening of the new Main Library building in 2000, the Friends have donated more than $750,000 to the Library. To join the Friends, download the membership form.